For as long as I can remember, I've been interested in Pop music of all kinds, whether it was the original Rock 'n' Roll sound of Elvis and Buddy Holly, the Punk racket of The Clash and The Ramones, the soft sounds of The Carpenters and Neil Diamond or the New Wave noise of A Flock Of Seagulls and Adam Ant. As long as it has a good tune, I'll give it a go. So, after three very fine albums, The Cockroaches split up (and that really bummed my flow). Since these were the days before the internet, it was difficult to find information on what the band members were doing. Well, one source told me that former Cockroaches members Jeff and Anthony had formed 'some kids band called The Wiggles' but that's all I knew. It wasn't until quite a few years later that The Wiggles's bright personalities and upbeat music made it's way to the U.S. and still a few years before they became the HUGE hit that they are now. If you are a parent of a Wiggles fan, you already know just how insanely catchy their music is and, if you hear it more than a handful of times, it either sticks in your head or annoys the crap out of you (or both). With me, I tend to enjoy the short bursts of fun and I'd recommend them to any parent, especially since there aren't a lot of musical role models on the scene now for toddlers and pre-school kids. 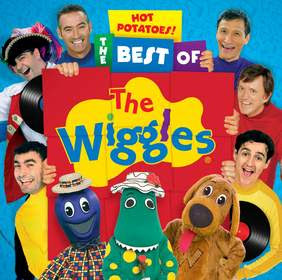 So, armed with that above information, I highly recommend HOT POTATOES: The Best Of The Wiggles. Not only does it have their most popular tunes, it features performances by artists not normally associated with children's programming: JOHN FOGERTY, KYLIE MINOGUE, JAMES BURTON AND LEO SAYER. Add in appearances from Steve Irwin, Paul Hester (Crowded House) and Rolf Harris and you've got yourself an instant party platter! Undeniably catchy, undeniably positive and undeniably fun, Hot Potatoes: The Best Of The Wiggles is the perfect intro to their wiggly world!